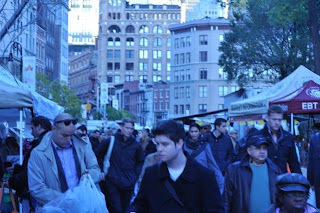 Finally did a "this is all I can carry" shopping trip at Union Square Farmers market, and picked up my first of the season sunchokes to go with the fresh pressed and local sunflower oil and sunflower seeds at home -- made a simple saute of Jerusalem Artichoke (Sunchoke) and Sunflower Seeds. 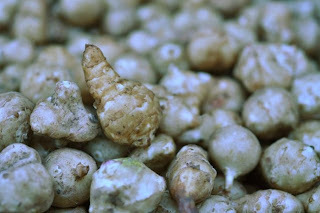 Sunchokes are tubers and a close relative of sunflowers. 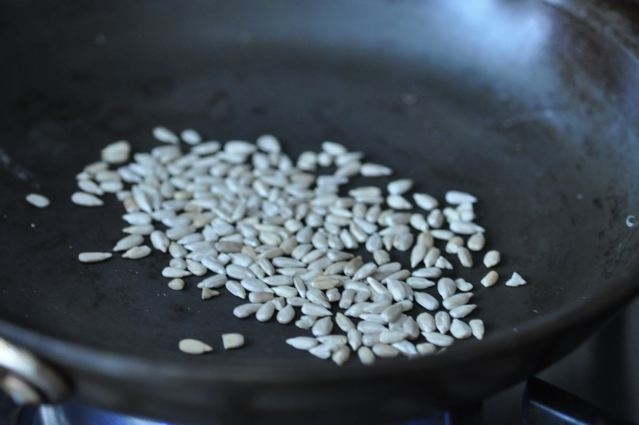 And, cooking them in sunflower oil and topping them with sunflower seeds makes for a nutrition-packed meal or side dish. Sunflower seeds are nutrient dense, rich in Vitamins E, B1, B5 and packed with trace minerals and healthy fats. Toast lightly over a low heat while you prep the other ingredients. Sunchokes, especially with the edible and tasty skin on for fiber, are super nutritious as well with an impressive 650 mg of potassium per cup and loads of iron too. 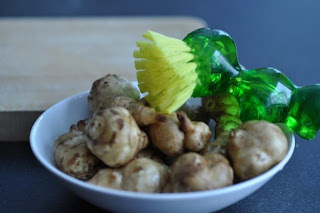 Be sure to wash them well with a scrubby brush (isn't mine cute?) to remove any trace soil. A simple recipe of just five ingredients brings together the earthy slightly nutty somewhat potatoey goodness of sunchokes with the mellow flavor of fresh pressed sunflower oil and crunchy nuttiness of the toasted seeds. 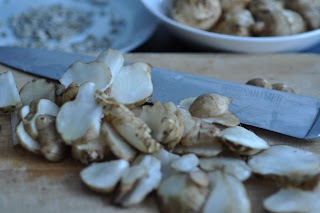 A garlic lover, only one clove is needed to add a garlic taste without overpowering the delicate flavor chokes. 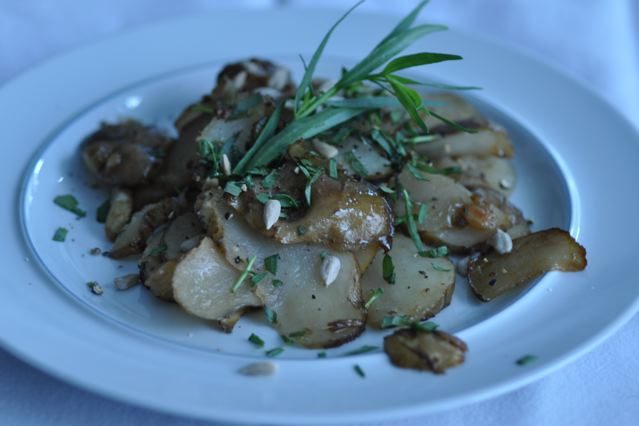 Tarragon adds bright color to an otherwise bland dish and a mild herb taste of anise or fennel. TIP: It's easier to cut the sunchokes width-wise into irregular coin shapes but I prefer to retain the long knobby shape and cut them lengthwise. To do so more easily, trim off a small piece from one edge and lie it flat on the cutting board so the tuber remains stable and doesn't wobble while you cut your slices. Either direction, for even cooking be sure to cut them evenly and as thin as possible (about an 1/8 of an inch thick). Toast sunflower seeds and set aside (I like to make extra for a snack). Heat sunflower oil in a heavy skillet. 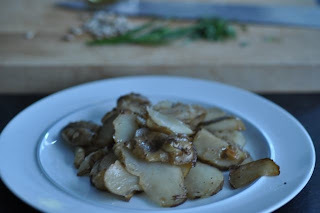 Toss in garlic and sunchokes and saute over a medium heat until the sunchokes begin to soften (if the pan dries out add an ounce or two of water). Throw in minced tarragon at the last minute and stir in toasted sunflower seeds. Season generously with a good quality salt and pepper, if desired. Garnish with tarragon for added color. 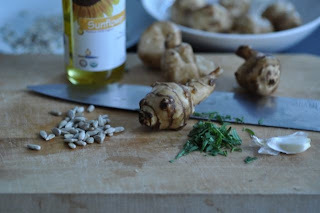 Visit the site for more recipes and health information on Jerusalem Artichokes (Sunchokes) at Lighthearted Locavore.